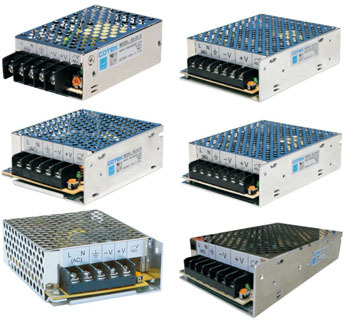 The Cotek GE series of switching power supplies are available in power ratings from 25 to 150 watts. These power supplies are durable, designed for 24/7 operation at full load for industrial grade applications (high operation temperature, up to 70°C), and install easily in compact spaces. The acceptable AC input range is 88~264VAC with high efficiency up to 90%. Protections include output short circuit, overvoltage, overload, overtemperature and brown-out (low AC input voltage). These power supplies feature high efficiency, long life and high reliability, and are also in compliance with EPA Energy Star requirements for external power supplies.